Christ the King Lutheran Church is being torn down to make way for a Bosa Brothers residential tower. The demolition of the little red brick 50s-era Christ the King Lutheran Church, across the street from the massive new Surrey City Hall, will likely be accomplished by Good Friday. And with its demise, not one but two congregations will be meeting for worship in other places for the next 18 months or so. 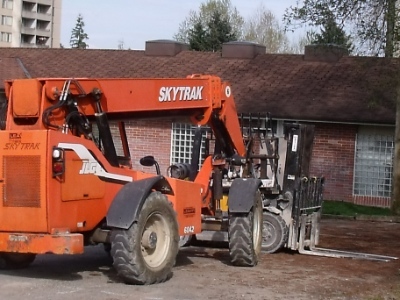 And the demolition illustrates the many changes that see new and regrouped churches around the burgeoning Central City area of Surrey meeting in a variety of shared or non-church settings. Church for Vancouver is presently engaged in a somewhat less than exhaustive survey of non-traditional church-meeting activities and facilities both south (this week) and north (next week) of the Fraser River. The demolition of Christ the King is the second step in what will end up as a new 300-seat worship/concert/meeting facility on its site. The land has been purchased by Bosa Brothers for construction of the first residential tower in a six-building complex north, east and west of the City Hall. The project is known as University District, identifying with Simon Fraser University’s Surrey campus a block to the south. The church will be a low-rise pod at the base of the new tower: A commercial facility with match it on the other side of the base. Christ the King will be meeting in the Woodward School, just around the corner. The Chinese Seventh Day Adventist congregation, which has been renting from Christ the King for some years, for Saturday services, has yet to announce where its new meeting place will be. The first step in this process involved the moving of Surrey Urban Mission, a trans-denominational effort initiated by the Lutheran synod with which Christ the King is affiliated, to a King George Boulevard a few blocks north. 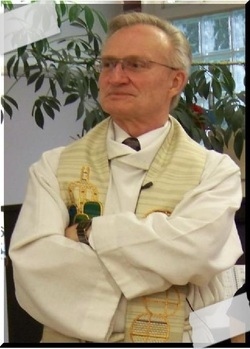 Gordon Charles is pastor of Christ the King Lutheran Church. Surrey Urban Mission is across the street from another street ministry, NightShift. Both missions receive support from a wide range of churches, businesses and community organizations, in order to meet the physical and spiritual needs of people living on the streets. Also involved in that move northward was Emmanuel Chinese Lutheran Church, which had been sharing facilities with Christ the King. It is next door to SUM. Christ the King pastor Charles Gordon notes that the new church will mean the beginning of a new era of service for the congregation, in the emerging Central City – something the church’s leaders could never have imagined in the late 50s, when it was founded. But Christ the King is not the only place where some church configurations which could never have been envisaged decades ago are becoming the new reality. Two blocks to the west of Christ the King, at Whalley Presbyterian Church, Seng Myung Saem, Rock of Salvation Community and Abundant Life Community churches meet at various times in the sanctuary. Among the four congregations, close to 300 people are provided pastoral care and worship opportunities in the building, whose sanctuary comfortably accommodates 150 people at a time. Two blocks south of Whalley Presbyterian, in a commodious building that was home to now extinct Oak Avenue United Church, three congregations meet. The lead church is Amazing Grace Taiwanese United. The other two, also Asian in origin, are named Central City Church and Come to Jesus Church. And two blocks south of Amazing Grace is Southside Community Church (Robson Park), a Baptist group that is part of a multi-site church based in east Burnaby. Both the Burnaby and Surrey sites are housed in buildings constructed for long-closed congregations, Edmonds Baptist and Parkview Baptist. A few blocks to the west of Grace Church, Surrey Alliance Church built a commodious 1,000-seat sanctuary a few years ago, when their original 500-seat facility grew too small. Between the two structures, there were classrooms and offices necessary to a large family-oriented church. In more recent years, the church’s leadership realized they had more space than was necessary. The result: The Salvation Army Community Church made its home in the smaller sanctuary and some of those other classrooms and offices. 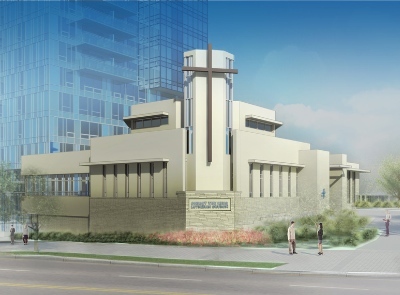 Back north, for the moment, to the Dell Shopping Centre, on King George Boulevard near 105th Avenue, is providing homes to two ‘storefront’ churches and office space the aforementioned Christ the King. Dell, owned, as it happens, by the same Bosa Brothers which is developing University District, has a few vacancies these days, as a result of all the changes going on in Central City/Whalley. The two storefronts, both Baptist, have, respectively, Filipino and Taiwanese roots. Four blocks to the east of Dell is Our Lady of Good Counsel, one of the largest Catholic churches in Surrey. A large part of that parish is Filipino in origin. The church complex includes a Catholic school and the St. John Bosco Community Centre. And, in a ‘wrap’ on this brief survey, another multi-site church is worth a mention. Calvary Worship Centre has converted two commercial buildings into places of worship in the Afro-Caribbean charismatic/Pentecostal style. One campus is near the Scott Road SkyTrain station at the south foot of the Pattullo Bridge. The other is across the bridge near Westminster Quay and the New Westminster SkyTrain Station.